The availability of footwear through various retail channels and the gaining prominence of online retailers is triggering the impulse buying behavior of consumers, thereby benefitting the footwear market. On the other hand, the availabity of counterfeit products that are developed by local manufacturers is anticipated to hinder the growth of the global footwear market during the forecast period. Footwear comprises men’s shoes, women’s shoes, and children’s shoes. These include all kinds of outdoor and indoor shoes made of materials such as leather, plastic, and rubber. 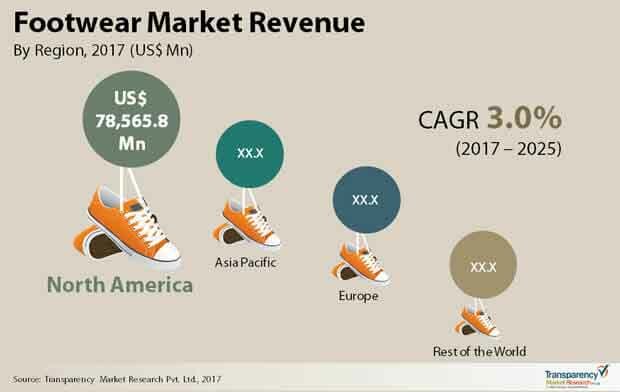 The global footwear market stood at a valuation of US$215709.0 mn in 2016 and is expected to be worth US$278860.7 mn by 2025 in terms of revenue rising at a CAGR of 3.0% between 2017 and 2025. By product type, the global footwear market is segmented into non-athletic footwear and athletic. Athletic footwear is further divided into soccer/football shoe, running and cross training/tennis shoe, golf shoe, hiking shoe, basketball shoe, baseball shoe, and others. On the other hand, non-athletic is sub-segmented into casual footwear, military boots, dress evening footwear, lite hiking outdoor sandal, and others. Non-athletic segment led the market in terms of both revenue and volume accounting a market share of approximately 52.9% and 64.0% respectively in 2016. The market has been classified on the basis of material into rubber, plastic, and others. Rubber held the dominant 24.2% revenue share and 25.6% volume share in the footwear market in 2016. This is because rubber is the most material that is used in every type of shoe ranging from athletic to non-athletic. Based on distribution channel, the market has been classified into online channels, supermarkets and hypermarkets, independent retail stores, shoe stores, independent retail stores, textile retailers, and departmental stores. In 2016, online channels, independent retail stores, and supermarkets and hypermarkets collectively held more than 70% of the market in terms of revenue. The high preference among consumers to make purchases through these channels accounts for their high revenue share to the overall market. On the basis of end-use, the footwear market is classified into men’s footwear, women’s footwear, and kid’s footwear. Among these, women’s footwear accounts for the leading contribution in terms of both revenue and volume. Women’s footwear remains a dynamic category with the presence of several brands, huge increase in points of sale, and significant budgets for marketing and advertising campaigns. On the basis of geography, the footwear market is divided in this report into North America, Europe, Asia Pacific, South America, and the Middle East and Africa. In terms of revenue, North America led the market in 2016 holding 35.6% of the overall market. However, Asia Pacific led in terms of volume accounting for 40.5% of the market in the same year.